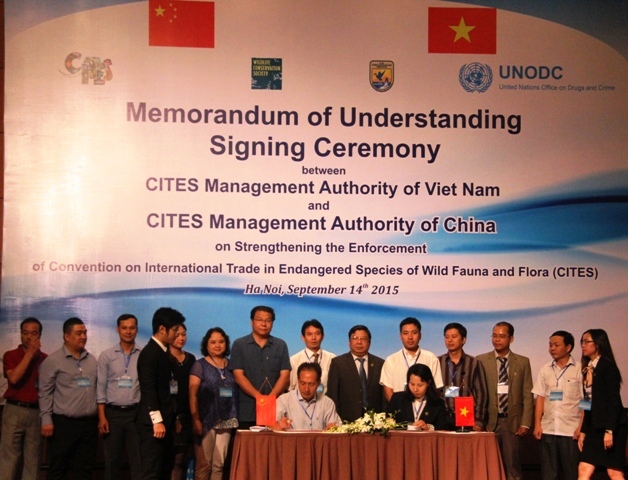 HA NOI (VNS) — An agreement to fortify the enforcement of the Convention on International Trade in Endangered Species of Wild Fauna and Flora (CITES) was signed yesterday between Viet Nam and China. Cao Chi Cong, director of the Viet Nam Administration of Forestry, said the event was a milestone in stopping the trade. Ha Thi Tuyet Nga, director of the Viet Nam CITES Management Authority, said the deal followed the revelation that Viet Nam and China were transhipment points for many international wildlife trafficking rings. And the two countries were facing the same challenges in preventing illegal wildlife trade, she said. Meng Xianlin, director-general of the CITES in China, said international co-operation was imperative in the fight against wildlife trafficking. Nguyen Minh Thuong, from CITES Viet Nam, said the Mong Cai Border Gate in north-eastern Quang Ninh Province was one fo the hotspots for trafficking.The province shares an 118km border with China's Quangxi Province. The provincial Customs Department dealt with 16 wildlife trafficking cases in the first eight months of this year, seizing nearly 1,700 kilos of wildlife products. The Convention on International Trade in Endangered Species of Wild Fauna and Flora is a multilateral treaty to protect endangered wild animals and species. The convention was signed in 1973 and was put into effect in 1975. The objective of the convention is to ensure that the international trade in specimens of wild animals and plants does not threaten their survival. CITES employs a common legal framework for its 181 member states to monitor the trading of more than 35 thousand species of wild animals and plants.